Last week our Event Planning committee held its second annual Young Professional’s Guide to Success, and I could not be more proud. As one of the committee chairs, I am so happy the committee was able to organize and pull off this successful networking event. Recent Penn State graduates and former Event Planning chairs Paige Blawlas and Stephanie Sapol started off the night by introducing the panelist to the 60 people in attendance. Opening up to students, all three panelists enlightened everyone in the room in a laid back environment on their past experiences and continually growing knowledge of the communications field. Panelists all agreed it is important to always be prepared because you never know whom you will meet at any event. Penn State alumni are everywhere, so do not underestimate someone before you get to know them. “You never know what someone else knows,” Paterno said. Your first job right out of school may not be your dream job, but if you are persistent, work hard and make the most of what you are doing in the moment, you will be able to move in the right direction as long as “you make sure you have a boss who believes in you,” Snyder said. Everyone has to start somewhere. In addition, don’t forget to always proofread whatever you send to potential employers. Try to be as well-rounded in the field as you can. Step outside of your comfort zone. Willingness to get to know your co-workers and bosses. Desire to help out wherever possible. Not being afraid to speak up. Being able to make people feel comfortable when talking to you. Always research whoever you are meeting or research the company where you will be interviewing. LinkedIn is great for this. Although it is great to dream big, it can be very beneficial to intern at a smaller company instead of a large corporation. All three panelists agreed you have a better chance of learning more and doing more hands-on projects at a smaller business than you would at a larger company. Additionally, the panelists suggested getting to know College of Communications mentors Bob Martin and Collette Rodger because they have connections everywhere and are always willing to help. “Every job you take and experience you have goes into your portfolio,” Paterno said. To wrap up the discussion, the panelists were asked to summarize their best piece of advice in one sentence. Everything said throughout the event can be directly applied not only to our professional careers, but to our personal lives as well. 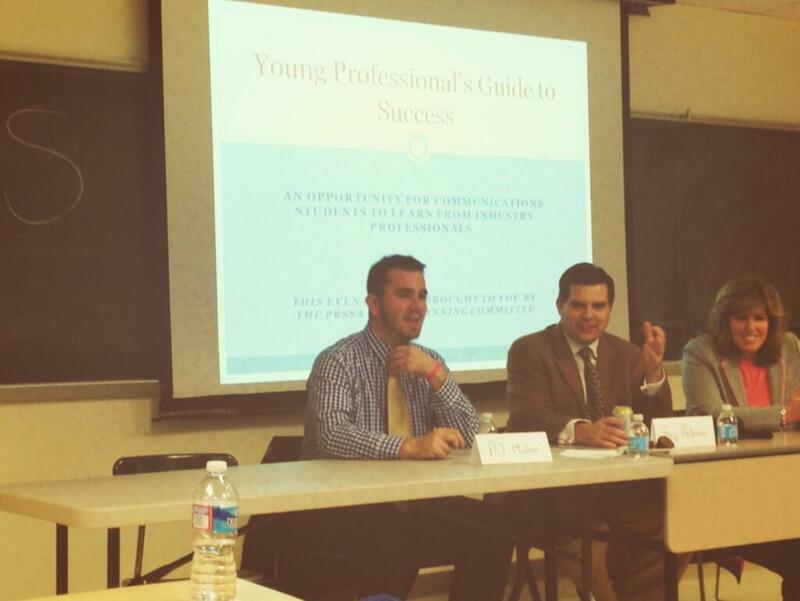 Everyone in attendance was thrilled to gain such valuable advice from distinguished alumni.